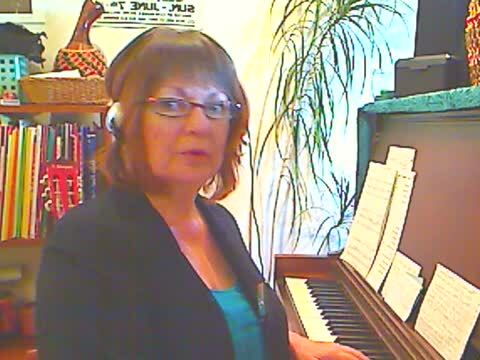 SKYPE on-line voice lessons are fun, convenient, and easy! Many students who live out of the Clark County area use this option a couple of times per month along with in person lessons for the convenience factor! Students all over the world can study with Trish using a webcam or SKYPE, or call in for lessons using speakerphone. 1. You register for a consultation/evaluation session with Trish where you will meet via Skype, prepay for your lessons and set up a lesson schedule. (There is a $5 per lesson discount for On-Line lessons). 2. If you are on Skype, Trisha's contact is: vocaltherapy. Add her as a contact on SKYPE before the lesson time. 3. Send a contact request on (skype). At the appointed lesson time ring Trish by clicking on the camera icon. 4. Mac users can record and save your lessons by downloading Video Conference Recorder at www.ecamm.com. PC users can download similar software at www.pamela.biz "Google Chrome' browser works best with Skype. 5. You will see Trish, AND yourself on the screen when taking the lesson by webcam. This is a very valuable teaching tool; when reviewing the lesson, you will be able to see what you are doing, not just hear it! 6. Although there may be some degree of latency (sound delay) when using the webcam method, many students get used to this very quickly and actually prefer the convenience of not having to drive to the studio, and the fact that you can see yourself on the playback. Using headphones helps tremendously. 7. For speakerphone lessons, call the studio at the appointed time. If you have an iphone you can use the FACETIME function- its almost like being there in person! Many cell phones offer Skype. With all this great technology, you can take lessons from anywhere! 8. All studio policies regarding payment and missed lessons apply to distance lessons. Contact Trish if you have any questions.